Metz, Centre Pompidou, from 26 May to 24 September 2012. Projecting an almost schizophrenic personality, the Centre Pompidou Metz is an anti-Centre Pompidou Metz. While the latter offers fifteen poor masterpieces absolutely unrelated and with no unifying theme, the former proposes a fascinating trip, rich in first-rate art works as well as less familiar ones taken from storage, a variety of fascinating documents and finally, stimulating but, above all, intelligent comparisons. 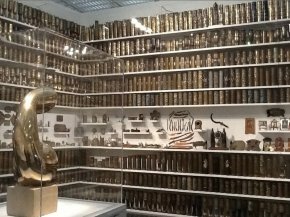 Indeed, this boundless show devoted to the year 1917 - with 3000 objects ! - does not just line them up side by side. It also instills them with meaning, exactly what we should expect from an exhibition. If we add the fact that the catalogue is just as accomplished, readers will clearly understand that this is one of the best shows currently available. The only caveat being that its very size makes it difficult to take it all in unless one disposes of enough time and that it also defies a complete review as we cannot possibly describe all of its aspects. However, we strongly recommend potential museum goers to consider a short trip on the high-speed TGV to Metz for a very worthwhile visit. This remarkable idea of offering a slice of time spanning just one year, and at a period generally considered to be weighed down with other concerns rather than that of looking at art, is in fact particularly pertinent. 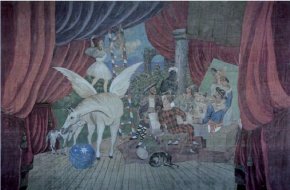 And yet it came about almost by accident : the original project was to present the magnificent theater curtain, Parade by Picasso (ill. 1), to the French public for the first time in a very long while. Its size makes it impossible to exhibit at the Musée d’Art Moderne. But what should hang next to it without repeating another Picasso exhibition for the umpteenth time ? The idea came quite naturally : since the work dates from 1917 why not show everything produced during this year, the next-to-last before the end of World War I ? At first, the curators never imagined how abundant the choice would be. The pickings were indeed plentiful and they limited themselves (minus a few exceptions) to their original goal : presenting only objects created in 1917. The result is not just an exercise in style. This juxtaposition of works, staged by the excellent Didier Blin, is never gratuitous. It allows us to understand the art of that time in all its complexity by constantly relating it to the dramatic context in which it, paradoxically, flourished. The first section attempts to show as thoroughly as possible the artistic profusion prevalent during the period. There has perhaps never been such an abundant number of different movements existing at the same time in art history ;the following were all active contemporaneously : Lucien Jonas, Pierre Bonnard, Marcel Duchamp, Pablo Picasso, Piet Mondrian and many more, corresponding to almost every possible style, from the most traditional to the most innovative. The year 1917, saw the death of Degas and Rodin, but also - give or take a few months, one of the rare chronological concessions made here - the appearance of Dada. While some were to completely revolutionize art, others, such as the Nabis, while perfectly modern, were still linked to the past. 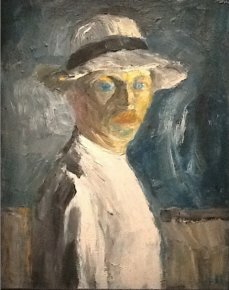 The exhibition of course shows some remarkable paintings and sculptures by the greatest artistic geniuses of the 20th century. We obviously expect it first of all to surprise us by allowing us to discover something we do not already know. It undeniably meets its goal. 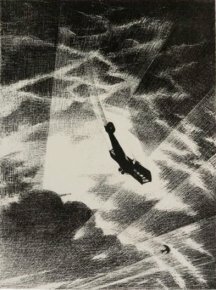 Many visitors will no doubt encounter the exceptional force of the paintings by the Englishman, Christopher Richard Wynne Nevinson for the first time. Of particular note are two very moving works. The first, entitled Paths of Glory, a title used later by Stanley Kubrick to express the same idea, shows two English soldiers dead in the trenches. Their deaths are evidently far from glorious. In England as in France, government authorities could not allow this sordid aspect of war to be publicized for fear of eliciting a defeatist attitude (we should remember that 1917 marked the outbreak of numerous mutinies). The work was thus prohibited from being exhibited and the artist chose to display it with a band marked "censored". 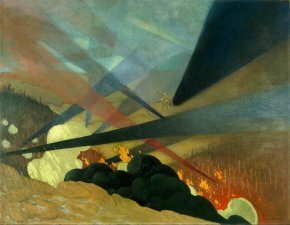 The second canvas represents a plane nosediving toward an enemy aircraft (ill. 2). This is a gripping image and it is hard to imagine a more "modern" representation of an otherwise completely figurative subject. 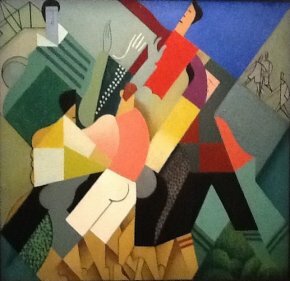 The ensuing lithograph (ill. 3), by underscoring the light effects in an almost geometrical manner, reminds us that the artist was familiar with Italian Futurists. 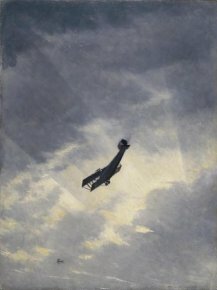 We were struck by the extent to which art in 1917 reflected so many different currents, but in fact falling into two camps depending on the subjects treated : some artists drew their inspiration directly from the war or its consequences while others seemed to ignore the fighting on the front. Brancusi, Chagall, Modigliani, Picasso himself, whatever their personal interest or implication in the conflict might be, made absolutely no allusion to it in their works . Monet, at the age of 77, could only contribute generously to charitable associations helping the wounded or orphaned, while pursuing his research of light and water in his Nymphéas series. One of the highlights of the show is the presentation of the works by Félix Vallotton. Although he was Swiss, thus a citizen of a neutral nation and also too old to fight, in June 1917 he visited the battlefields in Champagne on a mission for the Ministère des Armées and reflected on the manner in which to depict the war. His experience resulted in an absolute and troubling masterpiece, Verdun (ill. 4), acquired in 1976 by the Musée de l’Armée and, in our opinion, still not well known to the public. Vallotton is undoubtedly one of the finest painters of the first half of the 20th century, which abounds in great masters . As we said earlier, the exhibition is a blend of great names as well as more unfamiliar figures. 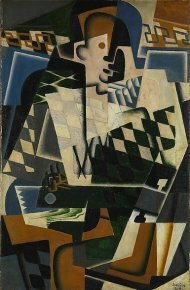 We do not find it necessarily useful to list the first except to say that, obviously, the Picassos, Matisses, the sumptuous Kandinskys (let us remember that 1917 was also the year of the Russian Revolution which could not be overlooked here), André Lhote’s Rugby (ill. 5), Juan Gris’ Harlequin with a Guitar (ill. 6) (acquired by the Metropolitan Museum in 2008), the photographs of Kertesz or Man Ray will satisfy the most demanding visitor. But there is much more. 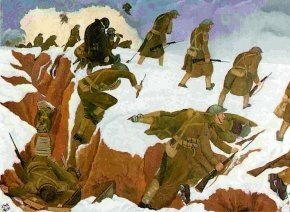 Less renowned artists are also on view and many are very interesting such as, already in the first room, the Austrian Albin Egger-Lienz with his Nordfrankreich (ill. 7), illustrating an attack in the trenches. Like Nevinson, or John Nash (ill. 8), this artist who is relatively unknown in France, and does not in any way correspond to the canons of modernism, managed to create a beautiful and evocative work with means me might find very passé. We also discover an unfamiliar aspect of art during the war, reflecting both popular or decorative art, naive or scholarly art : the sculptures and engravings made from debris recovered from battle fields, notably shell casings, often by unknown soldiers. The exhibition juxtaposes several hundred in a stunning pile (ill. 9) in a faceoff with Duchamp’s Fountain (and Brancusi’s Princess X) offering a stimulating comparison, underscored by an excellent catalogue essay written by Jean-Jacques Leble (who also set up this installation), with the contemporaneous Dadaism movement. The second half of the exhibition is thematic, focusing on the ties between artistic creation and the more visible consequences of war : the destruction (of landscapes and cities, but also of people...) and the reconstruction effort. This new visit begins with a series of likenesses (including the superb self-portrait by Nolde - ill. 10 - so influenced by Van Gogh) then immediately transitions into a presentation of the terrifying results of trench fighting. 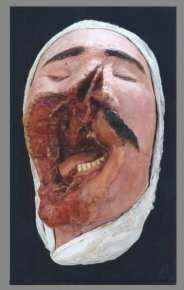 A "before" and "after" in a way with notably the wax casts of the famous "gueules cassés" (ill. 11) from the Musée du Service de santé des armées (Val-de-Grâce). No matter how often one has seen this kind of mutilation (particularly on film), this part of the exhibition is no doubt one of the most troubling. In this final part of the visit, visitors will also be sure to remark the section on camouflage. Here we learn that many artists, including André Lhote, André Devambez, Othon Friesz, Paul Landowski... were drafted into the Camouflage division to design works not meant for exhibition (except for pieces such as a fake tree fragment), not for view, of a passing nature and intended (in case of defeat) for the rubbish heap. Everything here, as is the rest, is fascinating. For once, we can understand that given the abundant material, the curators chose to systematically omit entries for the works in the catalogue. The publication, besides the introductory essays, is made up first of an alphabet for 1917, covering almost all of the themes treated in the exhibition, offering entries for the artists, movements, the principal events of the war and the major figures of the period ; the second part is a calendar presentation retracing, day after day, the main historical, diplomatic or artistic facts. Readers will find it particularly fascinating and discover it cannot be perused in a linear manner. The method is an almost impressionist approach allowing us to grasp all of 1917, and only this year. Nevertheless, the lack of entries is a hindrance in some cases. We would have liked to see some works explained more fully. The artists do not have corresponding entries in the alphabet, only illustrations. Thus, we do not learn anything about Albin Egger-Lienz, a painter we mentioned above and who does not receive a single line in the catalogue. Non-specialists will no doubt also wonder not so much about André Lhote himself whom we hope is familiar to the public, but his superb painting Rugby (ill. 5) or the engraving with the evocative name The Portrait of Someone who Is about to Die. Does the first completely ignore the war or does the artist see an allegory (or an antithesis) to trench fighting in these scrums ? Is the person about to die, as we might think, leaving for the front ? We will have to search elsewhere for the answers if we want to find the meaning of these works. However, we would like to repeat that despite these slight drawbacks, the catalogue is a valuable tool and a very beautiful book which we highly recommend. We will conclude, as does the exhibition, in the same way we started this article, with Picasso’s theater curtain, Parade. Its permanent hang seems to raise conservation problems  which we are sure must have some sort of solution. And since Paris cannot seem to find a spot to display it permanently, why not leave it in Metz ? Acquiring important works for regional museums, depositing those which cannot easily be exhibited in Paris, organizing exhibitions with consistent themes should indeed be the purpose of cultural "decentralization". Curators : Laurent Le Bon and Claire Garnier. Under the supervision of Claire Garnier and Laurent Le Bon, 1917, 2012, Editions du Centre Pompidou-Metz, 592 p., 49.90€. ISBN : 978-2-35983-019-4. Visitor information : Centre Pompidou-Metz, 1 parvis des Droits de l’Homme, 57000 Metz. Tel : +33 (0)3 87 15 39 39. Open every day except Tuesday, from 11 am to 6 pm, Saturday and Sunday from 10 am to 8 pm. Admission : 7€. At least as presented in the exhibition ; we do not claim to know their entire production between 1914 and 1918. We look forward to the retrospective planned at the Musée d’Orsay. The work is so heavy and so big that it collapses since it is not fixed on a stretcher.